I work in a Section 23 classroom for kids with acute mental illness. They are between the age of 12-18 and the program is designed to integrate kids back to school while earning a few high school credits and taking part in an intense therapy component. There are 8 students enrolled for 6-8 weeks and our team consists of a teacher, CYC (Child and Youth Counsellor), social worker, psychiatrist and me, the EA (Educational Assistant). Today is the last day for the students and after the kids leave we have planned a end of the year BBQ gathering at the CYC’s house. Pool, fun in the sun and great food. I offered to bring this fabulous salad, something out of the ordinary with a little kick. It was a great excuse for me to go out and get myself a new mandoline as I just couldn’t picture myself cutting those little radishes wafer thin by hand. 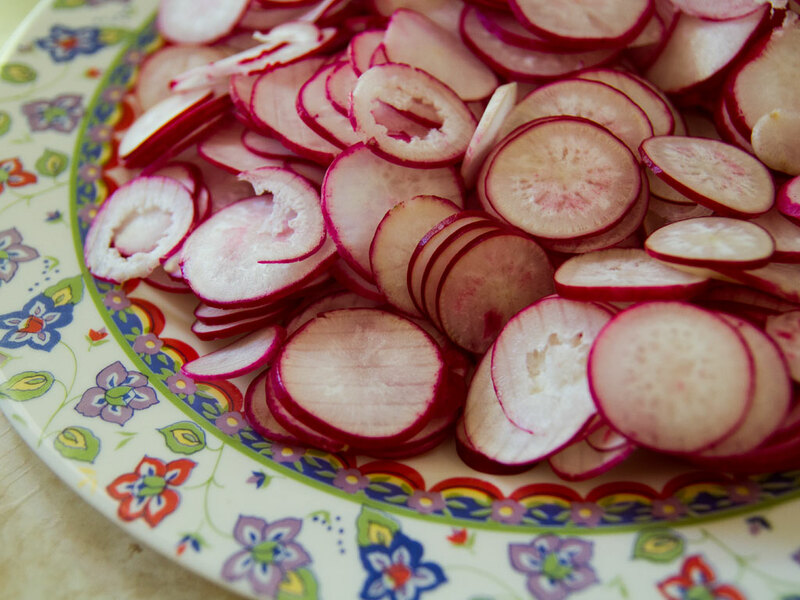 I chose to use a combination of multi-coloured radishes and regular red radishes. The salad is finished with delicate green chives cut directly from my kitchen garden. There are 4.8g net carbs and only 1 Weight Watchers points per serving. Mince shallot. Place in small bowl. Cover with 2 1/2 tablespoons of the vinegar add a pinch of salt and set aside. Trim the ends of the radishes. Thinly slice on a mandoline. Arrange slices on a platter. Season all over with salt. 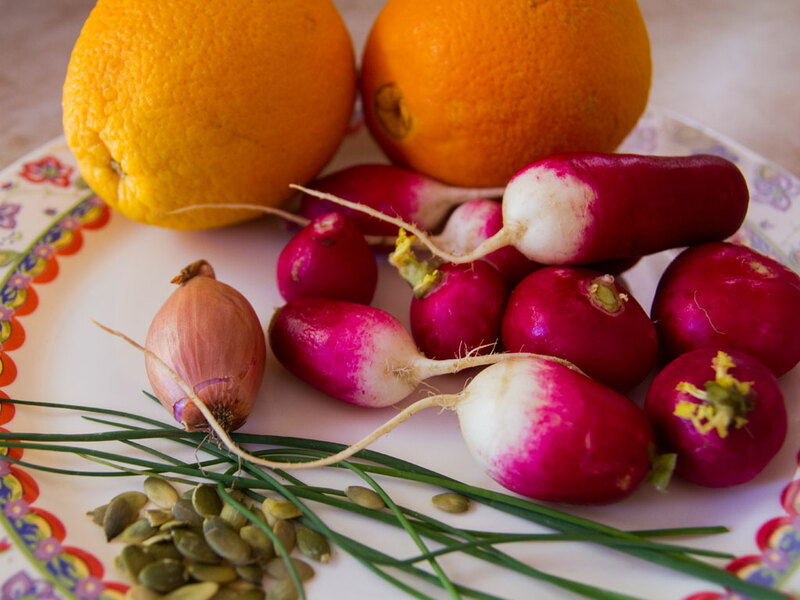 Cut off each end of each orange and squeeze over the radishes, then discard. Use a sharp knife to remove the skin from the orange. Cut in between membranes to remove each slice. Squeeze remaining membrane all over the radishes to extract any juice. Arrabge oranges over the radishes. 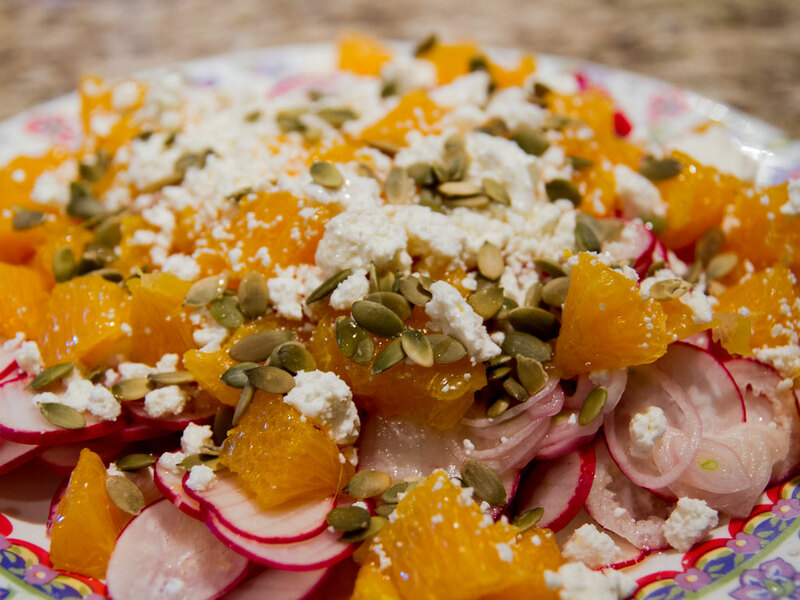 Srinkle pumpkin seeds and goat cheese to taste over the radishes and oranges. Pour macerated shallots and vinegar over top. Drizzle olive oil to taste (one to two tablespoons) over top. Scatter chives over top and let sit a few minutes (or longer — it benefits from a brief rest) before serving.